I few weeks ago I picked up a book that just 'called' to me. I was drawn to its pretty cover and when I saw the word 'fairy' I knew this book was for me!! I loved The 13 Treasures and The 13 Curses so much I knew we had to interview her! She's also here in the UK! How lucky are we?! Let me introduce you to Michelle Harrison! 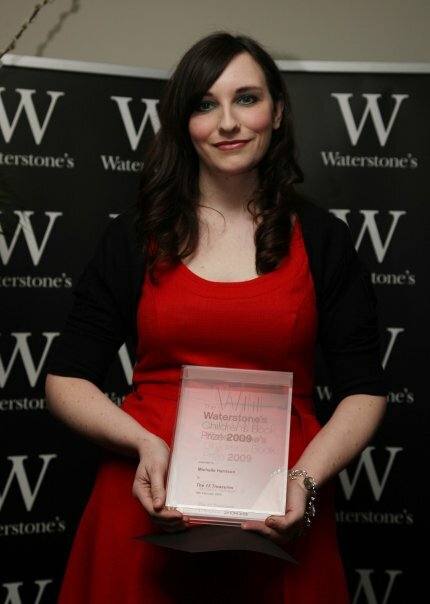 Michelle Harrison is 30 years old and an editorial assistant in children's publishing. She is a former bookseller at Ottakars/Waterstones in Stafford. Originally from Grays in Essex, she is a keen illustrator as well as writer and now lives in Oxfordshire with her partner. Her debut novel THE THIRTEEN TREASURES won the Waterstone's Children's Book Prize in 2009, it's sequel THIRTEEN CURSES published in 2010. SWEET BOOKSHELF: How did you come up with the idea for The 13 Treasures & The 13 Curses? Michelle Harrison: I first became interested in fairies when I was introduced to the artwork of Brian Froud, Alan Lee and Arthur Rackham on my illustration course. Their work showed the dark side of fairies and made me think about them in a new light. My niece, Tanya, was the second inspiration. She was, and still is, a bookworm, so I decided to name my heroine after her. The idea of a girl being tormented by fairies that no one else can see stemmed from my sister being told that Tanya would grow up to be psychic when she was a baby. Those were the two starting points and the ideas grew from there. The 13 Curses came from Red being such a strong character in the first book – I knew I had to make the second story hers, and at the end of book one everything was already in place. My favorite character is Red because of how savvy and adventurous she is. Who is your favorite character and why? Red is probably my favorite character, too. As soon as I wrote her into the book I knew she had a lot of scope for development and she really added elements of excitement and danger to the story. I also feel that Red sort of saved the book for me as well. She was quite late to make it into the story as part of a major rewrite I did as a result of so many rejections when I was submitting to agents. When I wrote her in something clicked, and I knew it finally felt right. The next agent I submitted to (who I’d previously been too intimidated to approach) took me on. You also did the illustrations for the chapter headings. Did you do any more illustrations that didn't make it into the book? I initially did six sample chapter illustrations. My agent encouraged me to finish the entire set so that all the illustrations were complete for submission to publishers. However, she also advised me to leave out any illustrations with human characters in order to let readers imagine them for themselves. At that point I’d drawn both Warwick and Morwenna, so those never made it into the finished book. There is a lot of fairy lore in your novels, did you do any research on faeries? Yes, I did quite a lot of research into fairy folklore and legend as I was writing. It led me to the legend of the thirteen treasures, which mainly appears in Arthurian legend but which I’ve adapted to suit my story. I also read up on changelings, the fairy courts, and the methods of protection people used to keep troublesome fairies away, some of which I’ve written into the book such as wearing the colour red. Are you currently working on another novel and can you tell us anything about it? Yes, I’m now working on a third in the ‘13’ series, in which we find out more about Red’s changeling-stealing past, and the people she was connected with. Red is about to find that putting her past behind her isn’t as easy as she’d hoped! It doesn’t have a confirmed title yet but I’ll post it on my website once it does. You work a full time job in publishing, when do you find the time to write? Since January I’ve been working three days a week in publishing, I was full-time prior to that. Last year, writing The 13 Curses with a full-time job plus promoting The 13 Treasures was really tough. I was working late into the night most nights to meet my deadline, and even taking my laptop into work to write on my lunch break. Thankfully I now write two days a week, plus at weekends, although sometimes those weekdays are used for other author work such as school visits and answering mail from readers. What is the BEST part of being a published author? The two things that are the best for me are fulfilling an ambition to be published after dreaming about being an author since I was young, and hearing from children who have never been keen on reading, but say they’ve changed their views after reading the books. Are you doing any tours or signing soon? I’ve recently done a promotional trip to the States, which was fantastic, and also toured schools in the UK in January on publication of The 13 Curses. I’ve got a few school events lined up throughout the year, and I’ll be at the Just So Festival in Staffordshire in August. Is there anything you wanted to say to The Sweet Bookshelf readers? Thanks for interviewing with us Michelle! We wish you all the best in your career and can't wait to read what's next! 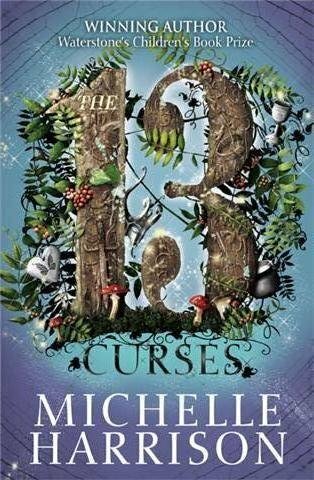 Check out my reviews for The 13 Treasures and The 13 Curses! I am desperate to read this. Okay, I really want to read this. Is it appropriate for Liz? She seems really cool. How neat though that she works in publishing and is writing books (and illustrating) Cool author.